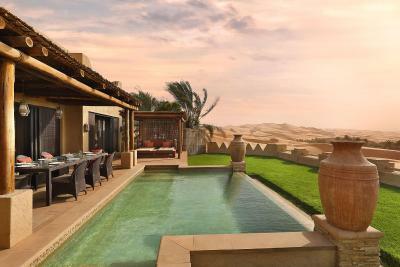 Lock in a great price for Anantara Qasr al Sarab Desert Resort – rated 9.3 by recent guests! The location and scenery of this resort is just amazing. Very friendly staff and we received a free upgrade to a Balcony room during our stay. The resort has plenty of outdoor activities. The reaction of the staff to my request to review their room policy concerning children. Very professional and helpful. 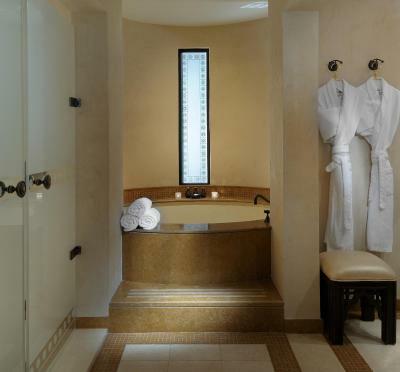 The resort feel and the immaculate appointments made this luxury getaway a fabulous treat. Everything about this property is AMAZING. We loved our time here from start to finish. All the little details are taken care of, the staff are wonderful and service is quick and attentive. The variety of activities on offer is brilliant and help make the most of the stunning location. Each activity delivered more than we were expecting. One of the most beautifully set locations I have been to. 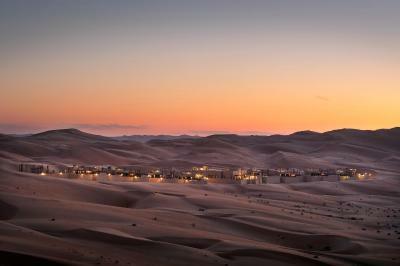 The hotel is deep in the sand dunes and the views are absolutely spectacular. The hotel is very traditional and is a very pleasant place to stay. The hotel is stunning and surrounded by the desert only, beautiful landscape! 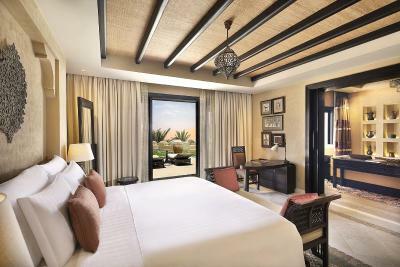 Anantara Qasr al Sarab Desert Resort This rating is a reflection of how the property compares to the industry standard when it comes to price, facilities and services available. It's based on a self-evaluation by the property. Use this rating to help choose your stay! 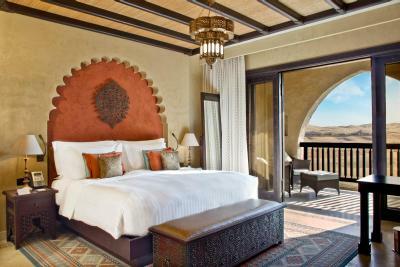 Serenely set within the Liwa Desert, this secluded retreat with stylish desert castle décor offers a breathtaking panorama. It also features an outdoor pool, spa and a gym. 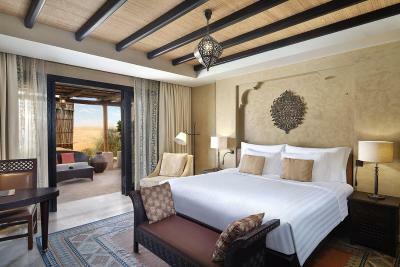 Qasr Al Sarab’s accommodations feature luxury fibers and earthy hues. All rooms have sliding glass doors opening to a terrace with desert views. They have a deep soaking bath, rain shower and a pillow menu. After a day of desert exploration, the outdoor pool surrounded with lounge chairs and palm trees provides a refreshing activity. 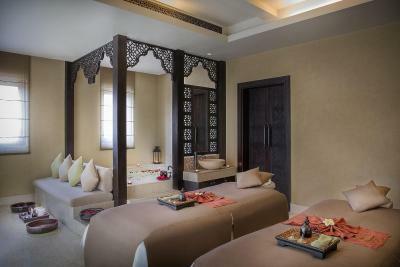 Alternatively, guests can enjoy a relaxing massage at the Anantara Spa or try the authentic hammam. 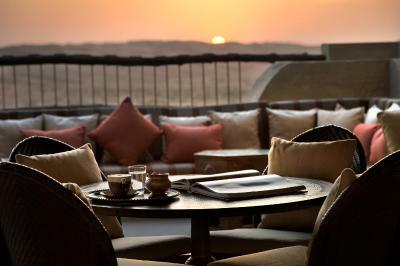 Anantara’s Al Waha restaurant serves fine Arabic cuisine, and food at the Suhail is French inspired. Light meals are served at Ghadeer restaurant, featuring an island setting accessible via bridges. 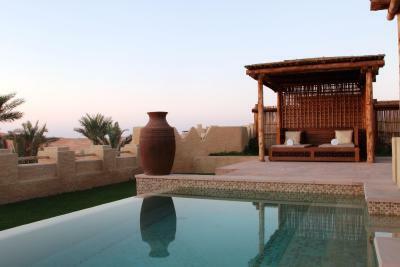 This desert resort is a 2-hour drive from Abu Dhabi and has free parking and free Wi-Fi. This property also has one of the top-rated locations in Jurayrah! Guests are happier about it compared to other properties in the area. This property is also rated for the best value in Jurayrah! Guests are getting more for their money when compared to other properties in this city. 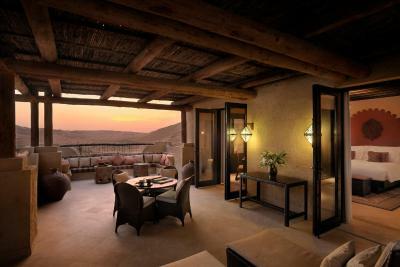 When would you like to stay at Anantara Qasr al Sarab Desert Resort? 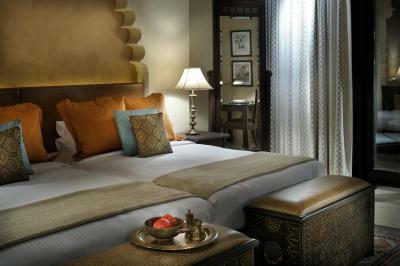 This spacious, air-conditioned room features traditional Arabic décor with a silver and bronze chandelier. It has a patio with desert views and garden access. It includes a flat-screen satellite TV and a private bathroom with free toiletries. Bed type requests are subject to availability. 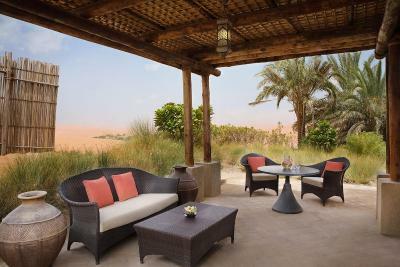 This spacious corner room includes an intimate outdoor dining area furnished with day beds. Large suite featuring a separate living room, kitchenette and private patio furnished with dining table and lounge chairs. 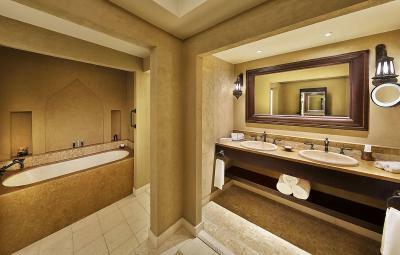 The suite can accommodate 2 adults and 1 child under 12 years of age. All villas have a large living room, a private plunge pool and outdoor shower. There is a personal butler service for added comfort. The villas can accommodate 2 adults and 1 child under 12 years of age. 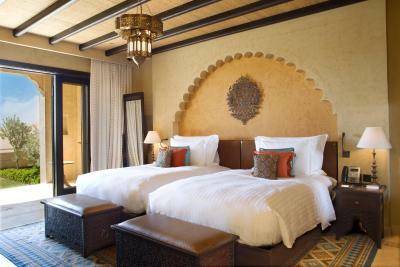 The room features a large, private balcony overlooking the desert valley. It includes a sitting area, flat-screen TV, and minibar. Featuring Arabian décor, this air-conditioned villa features free Wi-Fi, a separate living room, a dining area and a private plunge pool. The bathroom is fitted with an oversize bathtub and a rain shower. There is a personal butler service for added comfort. 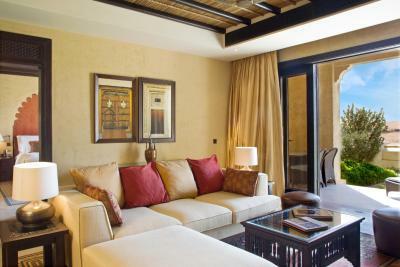 Large suite featuring a separate living room, kitchenette and private patio furnished with dining table and loungers. Please check the charges for the gala dinner in the fine print. 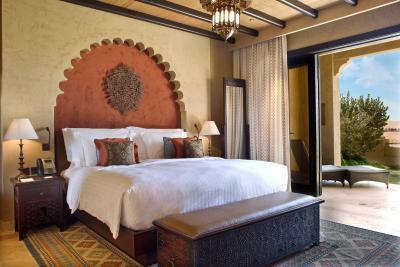 The room features a large, private balcony overlooking the desert valley. It comes with a seating area, flat-screen TV, and mini-bar. Please check the gala dinner charges under the fine print. 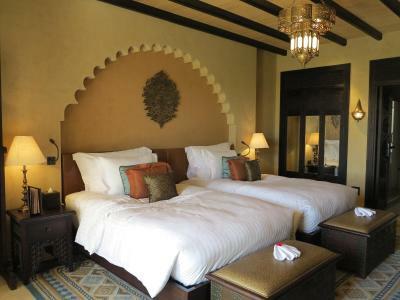 Featuring an Arabian décor, this air-conditioned villa features free Wi-Fi, a separate living room, a dining area and a private plunge pool. 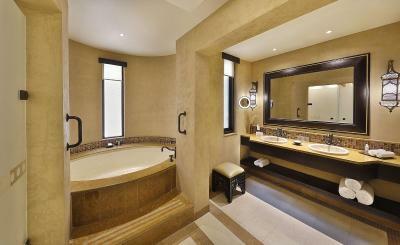 The bathroom is fitted with an oversize bathtub and a rain shower. There is a personal butler service for added comfort. • Daily buffet breakfast at The Restaurant or served a la carte in the comfort and privacy of your villa. • A delectable 3 course custom-made lunch served on your choice of The Terrace or at The Restaurant or alternatively in Al Waha or Ghadeer at the resort. 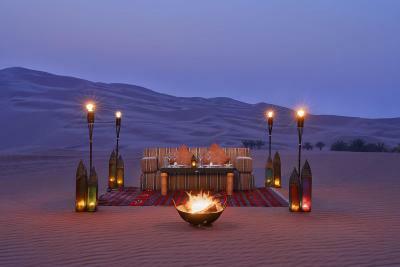 • Exquisite sundowner canapés and cocktails served on The Terrace offering spectacular views of the mesmerizing desert. • A lavish dinner at the restaurant or served by your private chef in the comfort of your own villa. 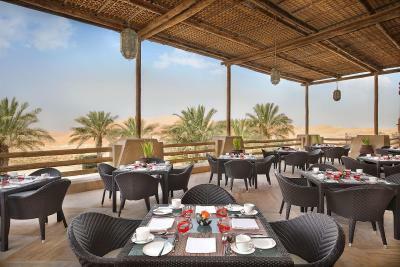 • For guests staying one or more nights, meals may be enjoyed at any of the restaurants at Qasr Al Sarab. • Two adventure activities per person per night stay from a choice of sunrise/sunset desert walk, archery, desert fat biking, landsailing, camel trek or falcon and saluki show. 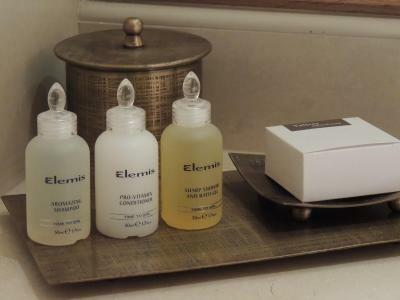 • Soft mini bar and in-villa refreshments (replenished daily). 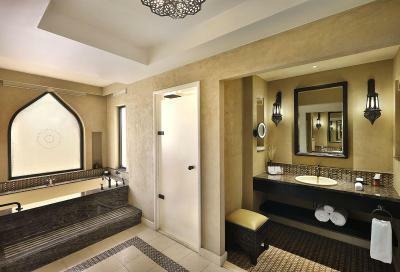 Unwind in unsurpassed comfort in a palatial oasis of serenity that reflects thousands of years of captivating tradition. 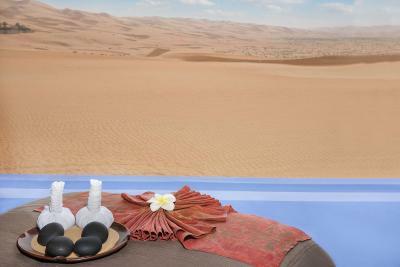 Experience a luxurious retreat that blends Arabian heritage with desert tranquillity. 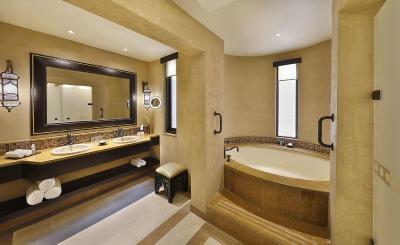 House Rules Anantara Qasr al Sarab Desert Resort takes special requests – add in the next step! Anantara Qasr al Sarab Desert Resort accepts these cards and reserves the right to temporarily hold an amount prior to arrival. Wonderful venue. Excellent for a family too. Price of the food menu and drinks so high . Sales pitch by the staff to buy products immediately After our visit to the spa whilst in the relaxation room!! Staff were generally very friendly, motivated and informed. However, rather low quality and overpriced food. The property is also quite dirty and not so well maintained. Doest really feel like a luxury resort. No evening entertainment activities at all. Definitely not worth the money and you are better off doing a one day desert tour from Abu Dhabi or Dubai. 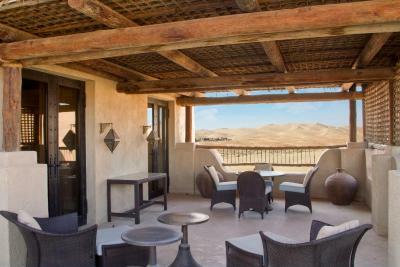 The close proximity to the desert and the views from the resort are amazing. Restaurants are really expensive, but also very nice! Nothing, my stay was exceptional! I'm not sure that the experience that I had at this Anantara will ever be topped. Everything was above and beyond my expectations from the staff, to the food, the property, and the activities. One of the first things I did when I got there was to climb the dune at the back of the property. I was in awe! An absolute must activity is to do the camel ride at sunset. Our guide, Waris, was incredible and the views and experience of it all was hands down my all-time favourite excursion. 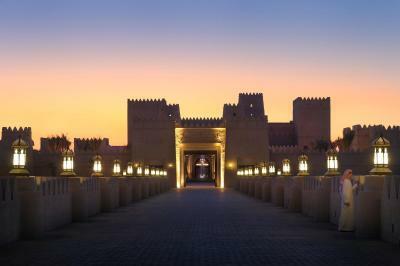 I loved my trip to the UAE and the Anantara was the highlight of my entire time there.